Gene A. Felice II, Nathaniel Ober, and Eve Warnock; curator: Katya Min. TRANSFLUX is a multi-media interactive exhibition at the San Francisco Yerba Buena Center for the Arts, YBCA, curated by Katya Min. Gene A. Felice II, Nathaniel Ober and Eve Warnock. It turns the Front-Door Gallery into an interactive demonstration of natural systems. Each work uses technology to present an interactive model of a basic natural cycle, from the intimate repetition of our heartbeats, to larger environmental cycles, and to the perpetual revolution of the solar systems. Eve Warnock and her life-partner Pelham Johnston created VESSEL, an interactive circulatory mechanism that follows the audience’s heart beat. The biometric information is transmitted to a hydraulic pump, releasing water through transparent surgical tubes. 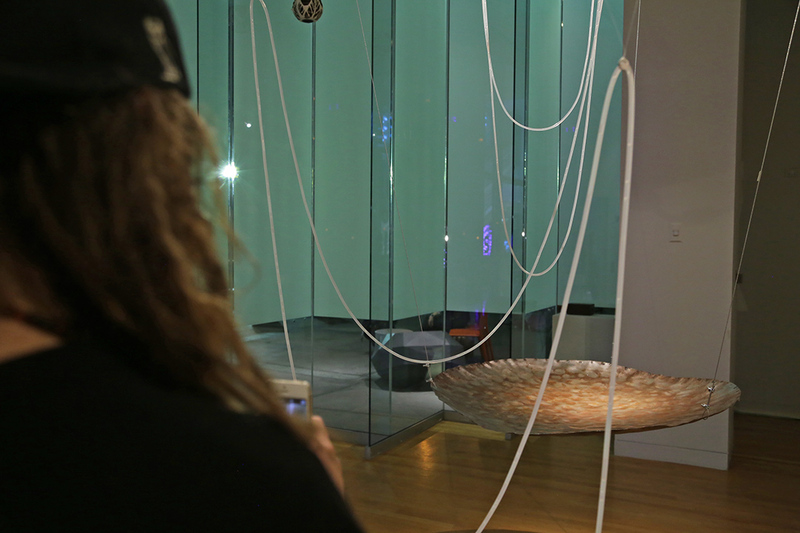 The viewers can then visually follow the resonance of their own heartbeats through the water path listen as it drops with a sound onto a hand-made steel drum. 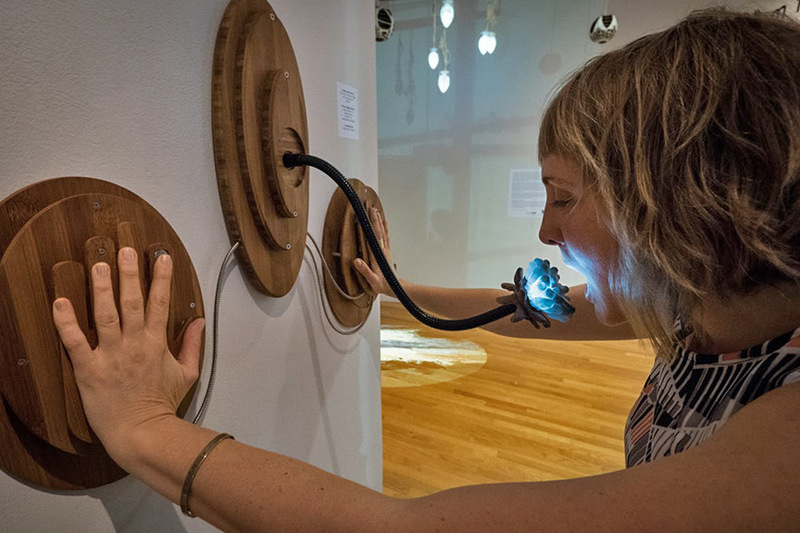 The viewers try to influence the rhythm of the mechanical installation by controlling their pulse, becoming aware of its connection to their emotional state. Warnock described the piece as romantic, saying that it uses mechanical language to reflect on the heart. She describes the piece as aiming for beauty through structure that enwraps the audience as they listen to the echo of their own heartbeat. She associates the sound of water hitting the metal drum is ritualistic and associates with the idea of an ancient container or watering hole as a gathering mark for animals and life. The artist feels that the perpetual pulsating circulation is romantic. The mechanical expression of our heartbeat is exciting and magical and also humbling and speaks of love. COACTIVE SYSTEMS is a collaborative project from Coaction Lab, where Gene A. Felice II in collaboration with David Kant, Tina Matthews and Nathan Ober display an independent environmental demo-system that uses plankton-based biosensors to monitor carbon dioxide and particulates in the ambient air. The installation is intended as a bimodal experience where the viewer is invited to trigger atmospheric changes or to observe it passively. Felice explains that this interdisciplinary work uses scientific vocabulary as the basis for a conceptual art project touching on concepts such as bio- and ecological art. The contribution of the artistic perspective here is that not being constrained by the need to produce any concrete scientific results or conclusions, the artists felt daring and displayed an installation meant to trigger the viewer to contemplate on the connections between bio-art and the environment. The ORRERY HARP is inspired by recent NASA projects in which sound waves were applied to measuring universal distances. Nathan Ober built on the idea of hearing the universe through scientific measurements. The Orrery is an antiquated mechanical device, invented during the age of enlightenment to demonstrate the motion of our solar system. In his piece, Ober transforms the device from visual to sonic space, demonstrating the solar revolutions through sound. 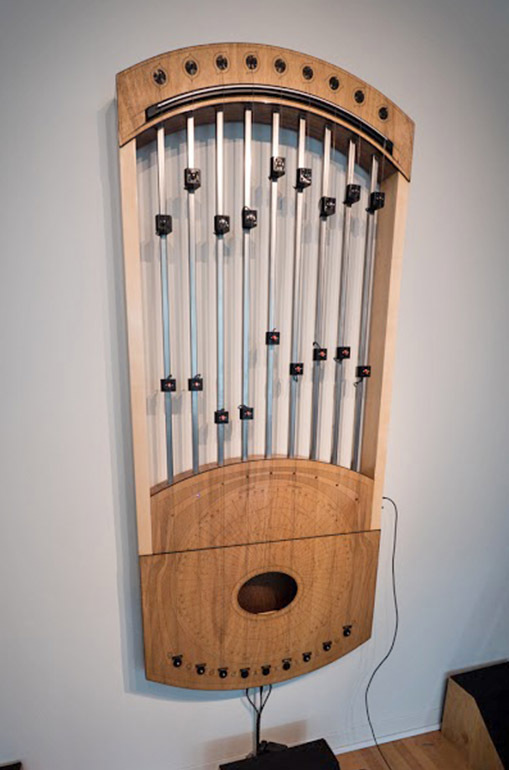 His harp is an autonomous wooden stringed instrument, which is activated electronically to produce autonomous sounds related to the rhythm of the solar revolutions. Ober made the entire wooden harp by hand, from the sound box to the electronic circuits. He taught himself to laser-cut wood and built the sound box while basing the mechanism on old musical instruments that he brought from India and Sri Lanka. In our conversation, Ober says that the choice of a technology-based project facilitates reaching to the audience by clarifying the artist’s unique perception of reality in concrete terms. He explains that the connection between art and science has existed in Ancient Greek culture and through the Renaissance and this project tries to rejoin these two areas that were only recently separated. The TRANSFLUX exhibition at YBCA is an interactive search for our abilities to influence natural mechanisms. The momentary influence of the viewers on their own heart rate or on the particulate level in the room, suggest contemplating on personal or environmental changes. These changes are impossible for the larger solar systems, which are beyond out control. The three installations use these scientific contemplations as a conceptual basis for making art and technology as their mode of production. Yet, while they may all be classified under these categories, their artistic approach is very different. A closer examination reveals three completely different modes of practice. Those range from the bare conceptual COACTIVE SYSTEMS, to the artistic rendering of biological systems in VESSELS and to the ORRERY HARP, which transforms the scientific concept into an artistic space.